The theory of motives originated from Grothendieck's "universal cohomology theory". It is a vibrant area of current research in modern mathematics. One may describe motives as an intermediate step between algebraic varieties and their linear invariants (cohomology). As such the theory of motives provides a conceptual framework for the study of periods. Feynman amplitudes date back to the early days of perturbative quantum field theory. They are highly intricate integrals over a large number of variables, and appear as coefficients of power expansions. The efficient calculation of Feynman amplitudes is of foremost importance for theoretical predictions in high-energy physics. Thanks to the path-breaking work by Bloch, Connes, Esnault, Goncharov, Kreimer, Marcolli, and others, a beautiful relation between Feynman amplitudes and periods has emerged. By bringing together leading expositors of the field, the school aims at training a new generation of graduate students and young researchers in the state of the art techniques behind these deep and important results. This school will consist of three weeks of lecture courses supplemented by exercise and problem sessions. The aim of these courses is to provide a pedagogical introduction to the field as well as introducing advanced tools and techniques necessary to play an active role in current research. The courses of the fourth week of this school aim at a higher level. In five mini-courses experts will present topics of great future promise as well as outline some open problems under current investigation. Applications must be completed online at the Registration section of the ICMAT website. 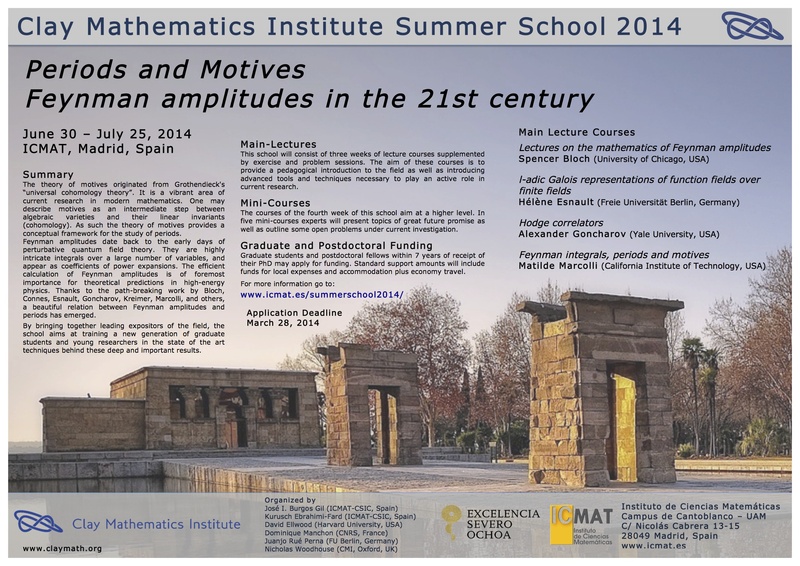 All applicants should complete the online form as well as send a copy of their CV including a list of publications tosummerschool2014()icmat.es. A letter of recommendation from either a senior mathematician or mathematics advisor is required from all applicants.